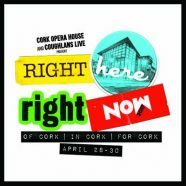 This May Bank Holiday the inaugural Right Here Right Now Festival will take place in association with Coughlan’s Live and Cork Opera House. This joint initiative was created as a means to celebrate, highlight and showcase Cork’s vibrant, music scene. The festival sees current high-profile acts join of the cream of leeside’s up and coming talent, as they make use of new spaces and alternative lay outs in the city’s most iconic venue. Anthony Kelly spoke with Brian Hassett of Coughlan’s Live Promotions to discuss this exciting new venture. Could you tell me how the idea to organise such an event came about? The opportunity to have this festival came about from Cork Opera House CEO Eileen Gleeson and all the team at the Opera House who we sat down and had a chat with, as like ourselves, they were keen to play a very real and active role in the local music scene and to help work alongside artists and bands. We wanted to highlight all the great songwriters, musicians and performers active right now. Throughout the weekend there is a heady mix of acoustic folk, roots, contemporary trad and jazz, Americana, groovy R&B, indie and blues all providing a snapshot of a wonderfully eclectic scene. Great gig’s, great experiences and great memories. I’d hope for that for both the artists and the audience, a real shared experience. I’d love for people to hear new artists and discover just how much great music is being recorded and released Right Here Right Now. Are you hoping to make this an annual event? We would love for this to become an annual event. Right Here Right Now ’17 is a 3 day festival, but when it came to programming acts it could very easily have been a week long with the amount of others groups we would’ve loved to include, which bodes well for 2018.